WSB 2018 – Jonny Rea Signs With Kawasaki For Two More Years! 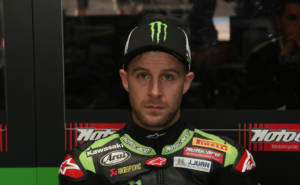 Jonny Rea has seen the light, as most expected he would, and turned down any offers for a second-rate MotoGP ride and other offers from within the WSB paddock to remain with Team Green another two seasons! Really, where else would he go? Even with the ever so slightly annoying performance balancing system (that handicaps anyone who’s done a great jobs in years past…) seeing new riders win races on machines that haven’t enjoyed victory for a while, thereby making his job a touch harder, staying put was the smart choice. The question now, is who will be alongside him? Especially given this weekend’s antics, which we won’t ruin today! Sykes is rumoured to be heading Yamaha’s way, with Alex Lowes or Michael van der Mark going in the other direction. Now Rea has signed, the rest will fall in place no doubt. Previous Post:Watch – Sportsbike Of The Year 2018 – BMW S 1000 RR – Dyno Run! Next Post:New – MV Agusta Turismo Veloce 800 Lusso ‘SCS’!